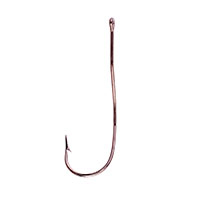 The round bend hook has an extra-long shank and a straight offset point. It is especially designed to keep the bait on the hook and is great for minnows or night crawler baits. The long shank also helps prevent the fish from swallowing the hook. The Carlisle hook works great when fishing for panfish or bream. 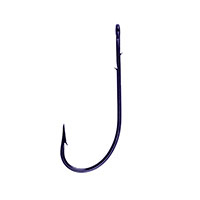 This versatile hook is used mostly with live and chunk bait and is great for beginner anglers that may not have a lot of experience “feeling the bite.” These hooks can be used for freshwater or saltwater and are the official hook of billfish tournaments coast to coast. 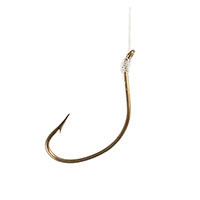 Circle hooks aid in the conservation of fish in catch-and-release fishing and can significantly reduce the number of fish killed in catch-and-release fishing because the hook’s design prevents deep hooking by helping it slide to the fish’s jaw or mouth corner, not its gut or throat. These hooks are designed specifically for making lead jig heads and flies. Jigs come in a variety of styles and colors and can be used at any skill level. Jigs can range from heavy wire to light wire. Fishing with jigs is great for catching salmon, walleye, and bass. 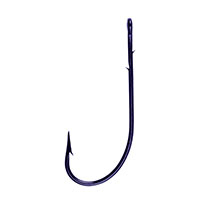 This is one of the most versatile hook on the market today. 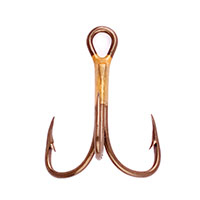 Others may know this hook as a wide gap or a shiner hook but the kahle was built exclusively by Eagle Claw. 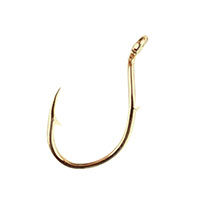 So versatile, this hook can be used with either live or chunk bait and is great for freshwater or saltwater. Kahle hooks come in a wide range of sizes and colors and can be used for bass, catfish, trout, redfish, drum, flounder, and more. 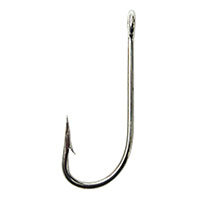 This hook has a round bend similar to the sproat hook but features an offset or “kirbed” point for better penetration. The point directs penetration at an angle with the shank to help prevent fish from shaking loose. Kirby hooks work great when fishing for yellowtail, wahoo, tuna and other gamefish and can be used for freshwater or saltwater or fishing. These hooks are designed for rigging live baitfish, such as minnows, through the lips or back to allow the fish to swim freely underwater. The hook size is dependent upon the bait size and the size of fish the angler is going after. 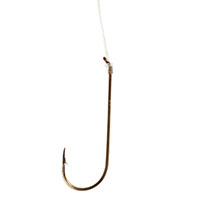 Live bait hooks are great for saltwater and large fish such as tuna. 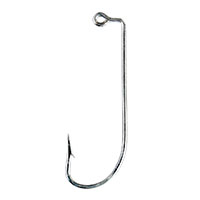 This hook resembles the sproat and the limerick hooks except that its point is bent slightly outward. It is usually made of heavy wire for extra strength. Anglers like it for dressing heavy wet flies and for bait fishing for slow biting fish. They are also a great for trot line fishing. 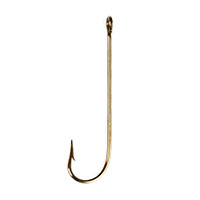 These hooks can be used in freshwater or saltwater. 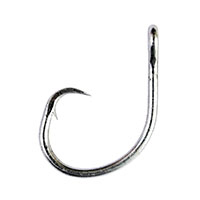 This is a short, extra strong round bend hook with a very long point. It was designed for commercial saltwater bait fishing to penetrate the hard, tough, mouths of big fish to prevent them from throwing the hook. The Siwash has excellent holding power for landing steelhead and salmon. The open eye models makes replacing hooks on lures easy. This straight point multi-use hook is one of the best and strongest early designs for freshwater fishing and is often used for dressing wet flies. When made with light wire it is an excellent dry fly hook. 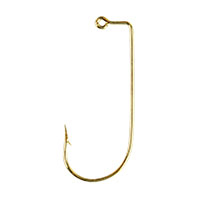 Sproat hooks also work great for live bait and lures. These hooks are designed with long, sharp points and extra-strong shanks for powerful steelhead and salmon. The turned up eye increases the gape for better hooking. These hooks are great for tying salmon and steelhead flies to. 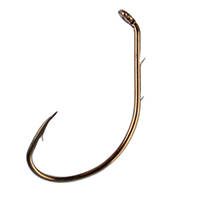 The signature three pronged design of a treble hook allows for high hook up ratio but the small gap of the three prongs can result in lost fish. The treble hook is often paired with hard bodied lures. 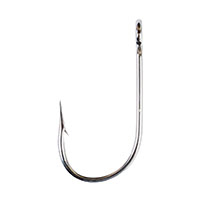 The short shank treble features the shortest shank on a hook (distance from the eye to the bend) and keeps the treble hook close to the lure’s body. Trebles can also be featured with a longer standard shank length and allows for better hookup rates in open water. The wide bend hook delivers the perfect combination of strength, design, and performance. Highlighted by ultra-sharp points and consistent construction, these hooks are ideal for a wide variety of walleye and steelhead applications. This wide bend has an extra-wide gap to hold bait and keep fish firmly hooked, from steelhead to walleye. The extra-sharp claw shaped point provides fast hookups and sure penetration of fish. From flippin’ and jigging to Texas rigging anglers are sure to find a worm hook that suits their style of fishing. Designed to make rigging easy and keep bait in place these hooks work with a variety of bait types and techniques and are great with soft baits. These hooks, paired with a deadly plastic worm work great when fishing for big bass.